A 14-year-old Christian boy, who was first reported to have been doused with petrol and set on fire because of his faith, died on Tuesday (14 April) in Lahore, Pakistan. Despite a special medical team formed to oversee his treatment and skin graft surgery a day before his death, and the fact that he was at one stage well enough to talk to visitors, Nauman Masih died of his injuries. Masih had burns to 55 per cent of his body when he was taken to Mayo Hospital, the city’s largest teaching hospital, on the afternoon of Friday 10 April. For the usually poor Christian minority, it can be notoriously difficult to register a crime with the police, but in this case the Masih family’s cause was aided when the Chief Minister of the Punjab, Mian Muhammad Shahbaz Sharif, ordered the police to make the case a priority. “The chief minister took notice of the incident in the evening and ordered the police to proceed on merit, after which they recorded Nauman’s statement and registered the first information report [FIR] accordingly,” Christian parliamentarian Shahzad Munchi told World Watch Monitor. Masih’s uncle, Nadeem Masih, filed the report (FIR no. 308/15) at Gulshan-e-Ravi Police Station, in the presence of police, family members and political and religious leaders, with his nephew in hospital. However, confusing conflicting reports then emerged. A prominent English-language newspaper, the Express Tribune, reported instead that the investigating officer said that the FIR was filed by Masih’s paternal grandfather, Heera Masih, who accused the uncle, Nadeem, and his wife of “ordering the attack”. “The couple wants to kill Nauman to get his house,” the officer is reported to have said. A similar interpretation of events was recorded by Dunya News. However, no local media reported what Nauman himself had been able to witness to police. World Watch Monitor understands Nauman’s parents separated and divorced, and his mother remarried. Her new husband did not want Nauman and his sister to live with them, so they went to live with their father’s brother and his wife. Later, his father died: reports say he left his house to his son, Nauman. Senior police have rejected all media reports that the boy was set alight by two Muslims for his faith (though Nauman himself is reported to have told police this happened); they say the real motive behind the incident is not yet clear. Police also denied recording the boy’s ‘dying declaration’ at the hospital, saying the contradictory statements of three people – Nauman’s maternal uncle Nadeem, his tailor Muneer (for whom Nauman worked) and maternal grandfather Heera Masih – had made the investigation complicated. “No dying declaration/statement was recorded by police due to the life-threatening condition of the boy,” Acting Deputy Inspector General (DIG) Rana Ayaz Saleem, head of the investigations wing, told respected newspaper, Dawn. Dawn also reported that the grandfather has been pressured by family to withdraw his FIR. 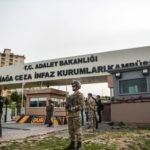 It remains unclear at publication whether the allegation against the uncle and aunt has any truth, but it has started to appear that the current climate of fear and inter-faith tension may have provided a ‘cover reason’ for a family property dispute crime. 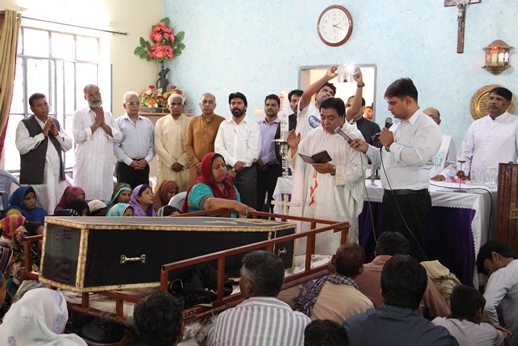 That the Pakistan Christian community fear there may be a media conspiracy to suppress the ‘killed for his faith’ motive is indicative of its nerve-stretched state, full of anxiety and tension, after recent events. Pakistani Christians often complain that they are discriminated against, on social and mainstream media. One recent example of this was the reporting that followed the church bombings of 15 March, when at least four terrorists, two of them wearing suicide jackets, attacked two churches in Youhanabad, the main Christian district of Lahore. The bombings were timed to cause maximum damage: more than 2,000 worshippers were in the two churches for Sunday services. But prompt action by church volunteer ‘guards’ prevented the attackers from entering the buildings. Still, the incidents left 20 people dead and another 80 injured. Angry protestors against the government’s perceived insufficient security measures took to the streets and snatched two suspects from a police van, beat them, killed them and then set their bodies on fire. Police had detained the two as suspected bomb attackers, but the reaction of the mob turned the focus away from the bombings and back onto the Christian community. Soon, across social and mainstream media, the two suspects were declared “innocent Muslims”, killed only “because they had beards”. Dr. Shahid Masood Khan, a surgeon and talk-show host of ‘Live with Dr. Shahid Masood’ on the News One TV Channel, was one prominent figure to quickly declare the two men “totally innocent”. On the Qutab Online talk show (on Samaa TV), aired directly from Youhanabad on 18 March, its host, Syed Bilal Qutab, stressed that no one would tolerate burning of the national flag. In Pakistan, the lynching of the two men overshadowed the deaths of the Christians and the plight of those suffering mental and physical trauma after the bombings. Christians also felt that the mainstream media failed to present a balanced view of events. 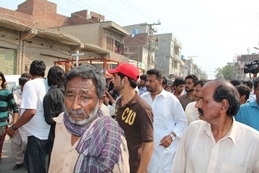 Talking to World Watch Monitor, Irfan Jamil, Bishop of Lahore, said that the Christian community categorically condemned the lynching of the two men, no matter who the two suspects were, “because violence has nothing to do with Christian teachings”. “The media should have played a balanced role and should have given equal coverage to the Christian community to explain how they saw the lynching and burning of the men, but the media drove a wedge between the Muslim majority and Christian minority,” he said. Christians are also disappointed at the way in which they feel the actions of terrorists are often disassociated from Pakistanis. The media and the state did little to expose those behind the church bomb attacks in Yahounabad. 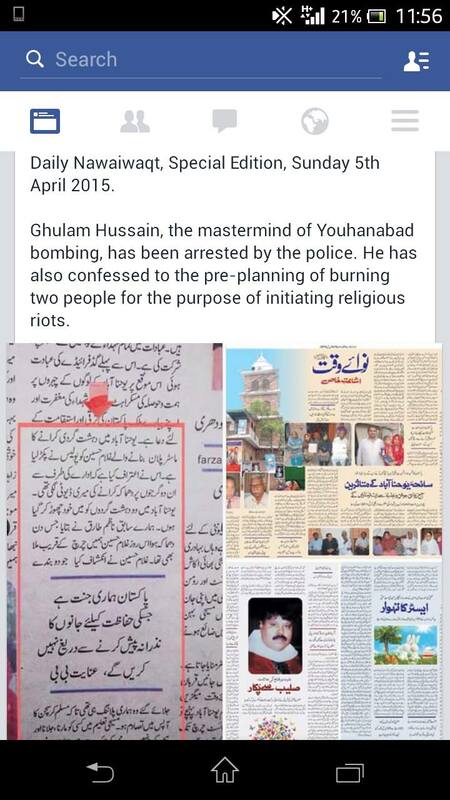 Conservative newspaper Nawa-e-Waqat ran a story about the arrest of Ghulam Hussain, the alleged mastermind. But this report had already been discredited by the Dawn newspaper, as “absolutely a (sic) false information“. On the evening of the second day after the attack on the churches, Muslims from the surrounding area started to pour into the ‘Christian enclave’ of Yahounabad, having seen televised images of Christians blocking a road, attacking a bus terminal, and attacking passers-by as well. 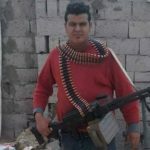 Residents report that the police avoided attendance that evening; the situation also deteriorated in adjacent areas and Christians were afraid, after hearing unfounded rumours of possible attacks. By the Friday after the Sunday bombs, a text message circulated that Bahar Colony, another nearby Christian slum, would be attacked after Muslims’ Friday prayers. Christians started to flee. Also, since most Christians are dependent on the majority for their subsistence, negative media coverage about the minority had a significant impact. Two days after the two men were killed, Interior Minister Chaudhry Nisar Khan told the National Assembly that their deaths at the hands of a crowd of young Christian men was “the worst form of terrorism”. “The Christians of Punjab have finally stood up and the rest of us are afraid,” said one journalist, Hashim bin Rashid in The News International. The government’s reaction against the alleged perpetrators of the ‘mob justice’ was strong. 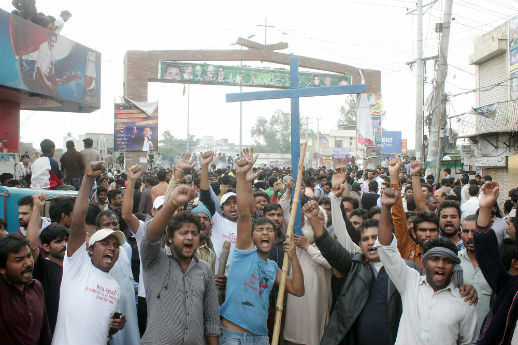 Thousands of Christians fled Youhanabad to avoid arrest or rumoured attacks from extremists. Still, there were reports that the police rounded up about 200 suspects after the lynchings. Asad Jamal, a Lahore-based lawyer who has written on legal issues in Pakistan’s English-language media, told World Watch Monitor, “Having met with those picked up by the police and other law enforcement agencies, I can confidently say that the police have used illegal detentions and torture both as a means to extract information and confessions, and to instil a feeling that they are ‘inferior’ in terms of caste, class and political status. 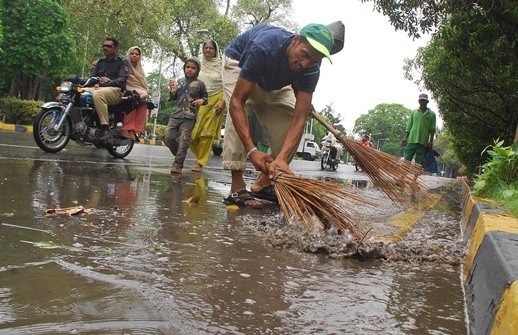 Several similar instances of mob violence have taken place in Pakistan in recent years, but the government’s response has rarely been so impassioned. The most recent example was the lynching of a Christian couple in Kot Radha Kishan, south of Lahore, in November last year. In July 2012, a reportedly “deranged” man, whose identity and religion were never disclosed, was accused of throwing pages of the Qur’an onto the street in Bahawalpur, further south. He was locked up in prison, but a frenzied mob broke in and dragged him onto the street, “doused him in petrol and set him on fire”, The Express Tribune reported. The government pursued neither case, nor did it pursue the attacks against Christians in Joseph Colony (2013) and Gojra (2009). The 2011 Pew Research Centre report, Rising Restrictions on Religion, characterises Pakistan as the third least tolerant country to religious diversity, while another of its reports, Muslim-Western Tensions Persist: Common Concerns About Islamic Extremism, says that only 16 per cent of Pakistanis hold a positive opinion of Christians.